Bring the tropical islands to you by have a Hawaiian luau themed party in NY. Kids and adults alike will love watching hula dancers, fire eaters and other forms of Polynesia entertainment. Our guide also features services who will provide interactive entertainment, including hula lessons. KidsParties.Party also features Hawaiian themed parties in NY. Check out their helpful guide by clicking here. Hawaiian Decor, Hula Dancing & more in NY! 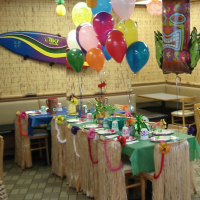 Themed Hawaiian decor, luau activities, and delicious food - what more could you want in a Hawaiian themed kid's party in NY? A local Manhattan children's birthday party service, Linda Kaye's Partymakers has all that and more! Equip with a tiki smoothie bar, a henna tattoo artist, a hula dance instructor, a caricature artist, a fun beach jewelry making activity, and Hawaiian beach bag party favors, this kid's party service has it all! 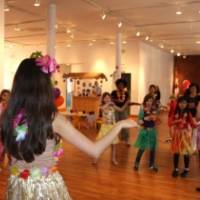 Bring Hawaii to New York for your kid's next birthday party, and plan a party that they will never forget. Call Linda Kaye's Partymakers, or check out their website, and browse through all the NY Hawaiian luau party options, along with a variety of more themed parties and services. Mermaids & Fire Dancers for your Hawaiian Party in NY! Experience a Hawaii luau with some fun party entertainment characters from Celebration Entertainment. With the option of both a mermaid entertainer and a fire dancer, this NY Hawaiian luau themed party service has what it takes to make your kid's party a fun and exciting experience. Renting equipment for your party will be no problem - Celebration Entertainment has every type of rental that you need to throw a wonderful party. From bouncy castles to tables and chairs, you can find it all here for your Hawaiian themed kid's birthday party. A Hula Dancing Show & Lessons in NY! Put on some grass skirts and leis, and have a blast hula dancing with Daisy Doodle. First take a front row seat watching Daisy Doodle perform an upbeat children's hula dancing show with authentic music and props, and then receive a hula dancing lesson! Your kid's Hawaiian luau party in NY will just not be complete without some high quality props and dancing. Browse through Daisy Doodle's website for more fun children's party ideas and services, and throw one of the most memorable Hawaiian luau parties that you or kid has ever been to. 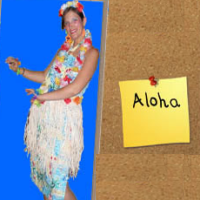 A Hula Dancing Character for your Luau in NY! Offering a wide variety of party entertainers and services, Adrenaline Entertainment offers everything to make your Hawaiian luau theme party in NY an amazingly fun time. The "Aloha" theme character is the perfect addition to your Hawaiian luau party, and she will not only impress the kids with her hula dance moves, but she will teach them how to hula too! Other services that Adrenaline Entertainment offers are face painting and balloon twisting. Get your face painted with a Hawaiian flower, and get a Hawaiian themed balloon made by these top NY Hawaiian luau party entertainers. Have a Luau-themed Party at this Tiki Paradise in NY! As one of Long Island's top Children's party places, Tiki Action Park offers top-notch accommodations for children's Hawaiian luau parties in New York. Choose to have a luau party theme, and your kid and guests will be given grass hula skirts, Hawaiian leis and Hibiscus flower hair clips. You can also choose between having your party in the Bamboo Party Room or the Tropical Picnic Area. This tropical paradise offers miniature golf, go-karting, and a variety of tiki party favors. There are a variety of party packages, so finding the right one for you will be no problem. Professional Polynesian Island Dancers in NY! 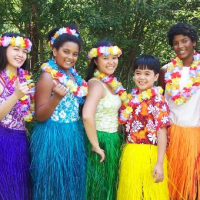 Serving all of the New York area, Dance Aloha provides wholesome entertainment for children's Hawaiian luau themed parties in NY. Trained in Polynesian Island dances such as the hula, the Tahitian and the Maori, Dance Aloha's professional dancers are sure to entertain and impress all your party guests. Specializing in kid's parties, these authentic Hawaiian dancers will make your Hawaiian luau party a memorable experience. The cost depends on the party circumstances, so call today for booking information. New York's Premier Hawaiian Hula Dancers! 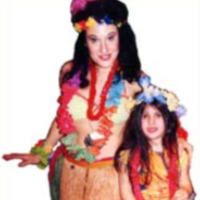 Spice up your kid's NY Hawaiian luau themed party by hiring real Hawaiian dancers from Hawaiian Tropical Paradise! 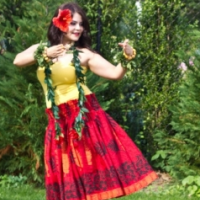 Specializing in hula, Tahitian dancing and belly dancing, these wholesome Hawaiian dancers will entertain you and the children throughout the entire party while wearing beautiful, vibrant costumes. Drop by their website to say "aloha," and set up Hawaiian dancing entertainment for your kid's next party. They will bring the show to anywhere in the New York area, and will perform at a variety of events, including birthdays, weddings, graduations, corporate events, and more.